another Christmas card for my sister! 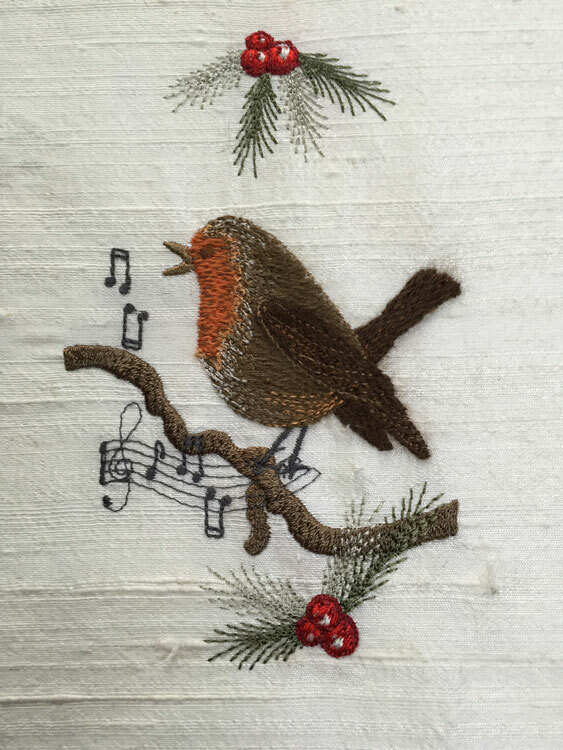 Its that time of year again when the days, hours and minutes fly by all too quickly and my Christmas embroidered card for my sister must be designed and finished to catch the last post. As so often happens when I have a deadline, the design refuses to work, no matter how much I rearrange the elements. Having had a a beautiful bird table for my birthday, I have been getting acquainted with the birds in my garden. The most frequent visitor apart from a corpulent squirrel is a little robin. I think he has been living in my garden for some time, or at least his ancestors have. On miserable wet days he sings his cheerful song and always looks so optimistic. A while back I decided to digitise him as I have never done a life-like bird before. After creating him for my Heirloom stocking which will be released in 2016, I decided he would be perfect for the embroidered card for my sister. Having recently experimented with Madeira Lana wool thread on the hair of my Celtic Angel, I decided to use this again for the main sections of his body. It is always fun to try out new threads and I found that I got quite a lot of lint in the bobbin area so I cleaned it out frequently. It is also best to slow your machine down considerably for this thread as it is thicker than normal threads and more likely to break if your machine is going fast. That was the easy bit but I struggled to decorate the area within the oval that is cut out on my cards. I experimented with elements from several collections including a branch from the Japanese blossoms collection. Decorating it with holly and ivy leaves just didn’t quite work. You can see my attempts here and what I was trying to achieve. I wondered if I could make dimensional leaves to sit outside of the oval. Maybe next year as few pine cones! 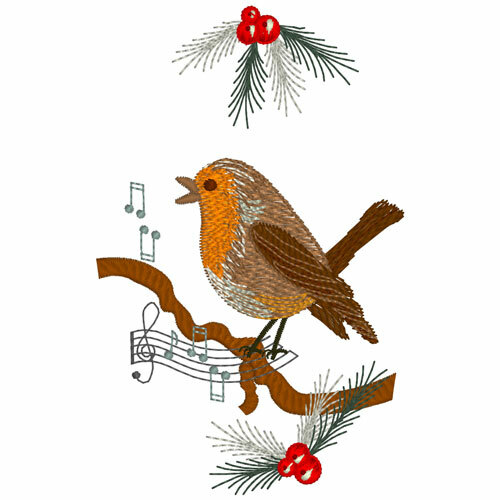 In the end I dismissed the holly and ivy leaves, and kept the holly berries and pine leaves along with a few musical notes from the Symphony of flowers to represent his cheerful song, preferring the simpler look. Hope you agree with my choices. The robin was stitched on ivory slubby silk dupion using Sulky soft n sheer which has become my favourite stabiliser this year. 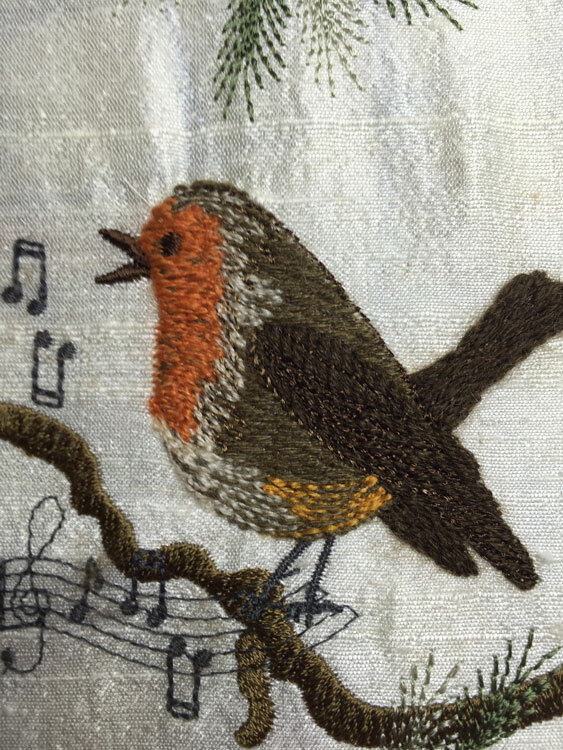 In this stitch out I used ordinary threads for the details that are added to the robin. I gave him a little brush with the Madeira brush that is available to fluff up this thread. I think you will agree with me that the silk makes the colours of the robin “pop”. The musical notes were stitched in Mettler 60 wt thread to give clearer details. After the embroidery was finished I trimmed it to fit inside my card. I always place some batting behind the embroidery and seal everything down with double sided tape. When I stitched it out the second time I used more of the wool thread for the details and darkened the colours in the details. 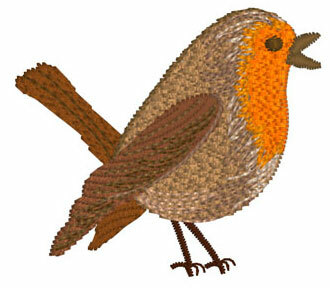 This is the robin before I brushed the wool. I must admit I prefer this version. The fluff of the wool thread makes it look like his feathers are caught in the breeze. 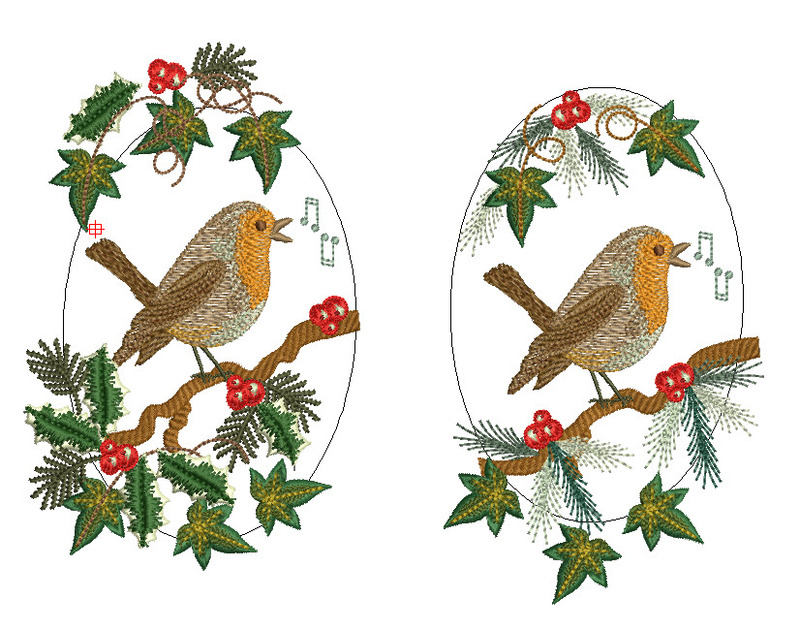 The robin along with the other designs in my Heirloom stocking will be released later in 2016. Thank you so much for following my blog. Follow this link to download a special freebie I have prepared for my blog friends. 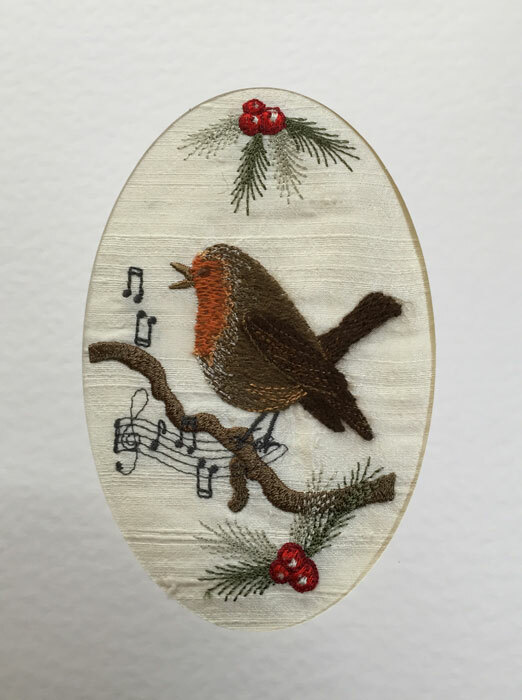 This entry was posted in Discussing machine embroidery, Embroidery projects, New Designs and tagged Christmas, combining embroidery designs, embroidery on silk, Making embroidered cards. Bookmark the permalink. 9 Responses to another Christmas card for my sister! Thank you for the lovely gift and I think your robin card is absolutely exquisite. Christmas card to your sister is beautiful! I just love birds! Thank you for the Christmas gift and all the gifts you give during the year. I love your work! Just seeing your little Robin cheered me up. Robins are the first birds I notice in the early spring. As usual, your work is stunning. Merry Christmas to you and your family. May all of these holiday blessings be yours to keep. Here’s to wishing you a Merry Christmas! What a beautiful robin! Thank you Hazel for the design. I hope you and your family had a very merry Christmas and a wonderful new year.